Is your pet exhibiting some behavior issues, such as inappropriate urination, inappropriate scratching, minor anxiety, aggression towards other pets in the house, or something else? It is ALWAYS important to discuss any issues with your veterinarian. Your pets doctor will talk with you, possibly recommend an appointment, to rule out any medical reason for the behavior. Below are some products we carry that may help with certain behaviors. Click on the logos to be directed to their websites for more information. And always feel free to call us if you have any questions or concerns. 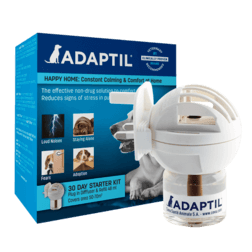 "Adaptil mimics the pheromones a puppy's mother dog emits." This helps a dog feel safe and secure in their environment. The pheromones help the puppy or dog by making them feel as though their mom is there protecting them. We carry the starter kit (which includes the diffuser and one refill) and the refills for the diffuser. Each refill lasts 30 days. It is recommended to change the diffuser every 6 months for maximum effectiveness. The diffuser is plugged into an outlet in a room where your puppy or dog stays the most, or where he or she goes when stressed out the most. It is a continuous diffusion that lasts up to 4 weeks, one diffuser covers up to 700 square feet. Multiple diffusers can be used throughout the house if needed. The diffuser is a good product to use to help continuously "tell" your dog that your home is a safe, comforting place to be. 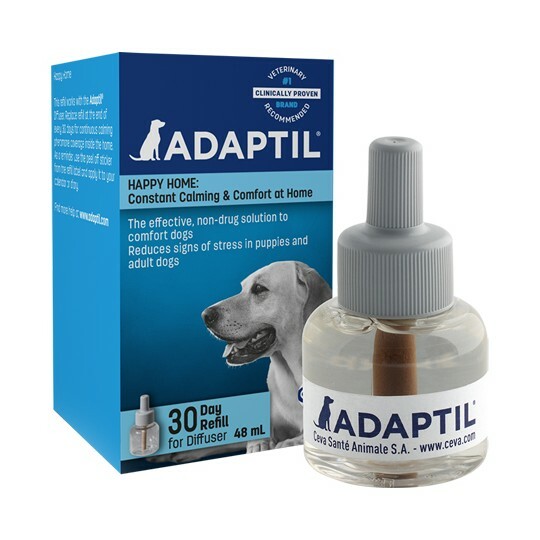 It reassures your dog during thunderstorms or other loud noises (fireworks, for example), alleviates separation problems, and helps newly adopted dogs to adapt to their new home. "Feliway can help take a cat from stressed out to chilled out." Feliway mimics the feline facial pheromone that cats produce naturally, therefore helping to reduce stress-related behaviors. 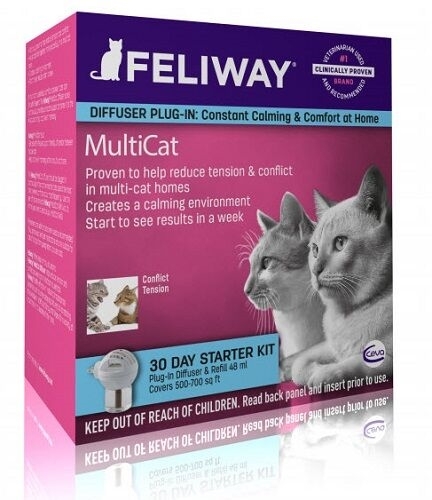 We carry the starter kits (which includes the diffuser and one refill) for both Feliway and Feliway Multicat and the refills for the diffusers. Each refill lasts 30 days and it is recommended to change the diffuser every 6 months for maximum effectiveness. We also carry the spray. The spray lasts 4-5 hours. The diffuser (either one) is plugged into an outlet where the cat spends the most time. It lasts for 30 days, covers up to 700 square feet and multiple diffusers can be used in the house, if needed. The diffuser is ideal for changes to the environment, introducing a new pet to the household, recurrent Feline Idiopathic Cystitis, stressful situations and urine spraying. The Multicat diffuser is ideally used in homes with multiple cats that are not getting along. The Feliway spray (which should NEVER be sprayed directly onto the cat) is ideally used for boarding, vertical scratching and traveling to the veterinarian. "Redirects cat scratching onto the scratching post." If you have a cat that is scratching the furniture, the curtains, the carpet, or anywhere else that you don't want him scratching, this product may be just what what you need. *If this does not work for your cat, there may be other environmental things that can be changed to help. Check with your veterinarian if that is the case. We carry the Feliscratch pipettes, which will last for 1 month. 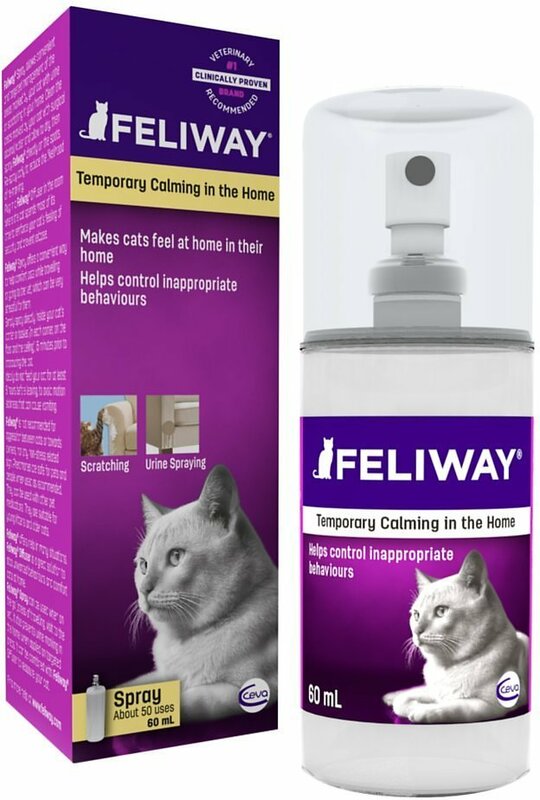 We also carry the Feliway spray, which you will need to spray in the area where the cat is exhibiting the unwanted scratching. It is recommended to apply 8 sprays at least once a day until the issue is resolved. 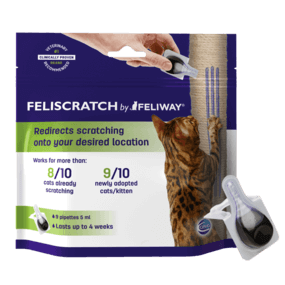 Feliscratch by Feliway is meant to redirect from an undesirable scratching location to a cat scratching post. It uses pheromones, catnip and blue stained lines to draw the cat to the post. The package includes 9 pipettes. You apply one pipette per day for the first 7 days, then one pipette at the beginning of week 3 and the beginning of week 4 (watch the video above to see how it works). For adult cats, you would need the Feliscratch and Feliway spray. For kittens, you would only need the Feliscratch. "Fear and anxiety play major roles in a majority of canine and feline behavioral issues. 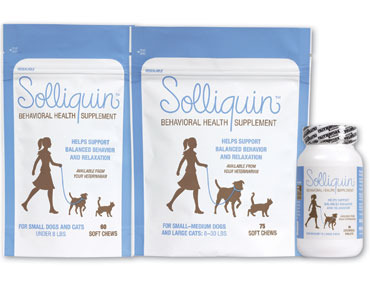 Solliquin is for dogs and cats to help support normal behavior and facilitate a calming effect." This can be used for early recognition of anxiety. We carry both the bags of soft chews for small dogs & cats and small to medium dogs & large cats and the bottle of chewable tablets for medium to large dogs. Solliquin is relaxation without sedation, intended for daily use and comes in tasty chews and chew tablets. For small dogs & cats, there are 60 chews in a bag, one chew a day. For small to medium dogs & large cats, there are 75 chews in a bag, one chew a day (for 8-15 lbs) or 2 chews a day (for 16-30 lbs). For the medium to large dogs, there are 45 tablets in a bottle, 1/2 tablet a day (for 31-45 lbs) or 1 tablet a day (for 46-90 lbs). 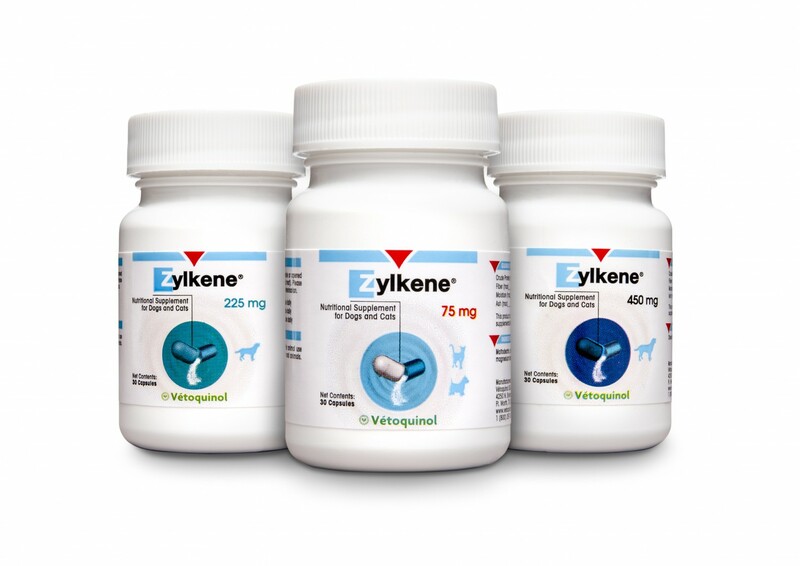 "Zylkene can help improve quality of life for pets—and their owners!" Zylkene can help balance reactions in some situations and help them maintain normal and relaxed dispositions. It can also make them more receptive of behavior-modification training. We carry 30 count bottles and 14 count blister packs. It can be given long term or short term. It can be administered orally or opened and sprinkled on food. 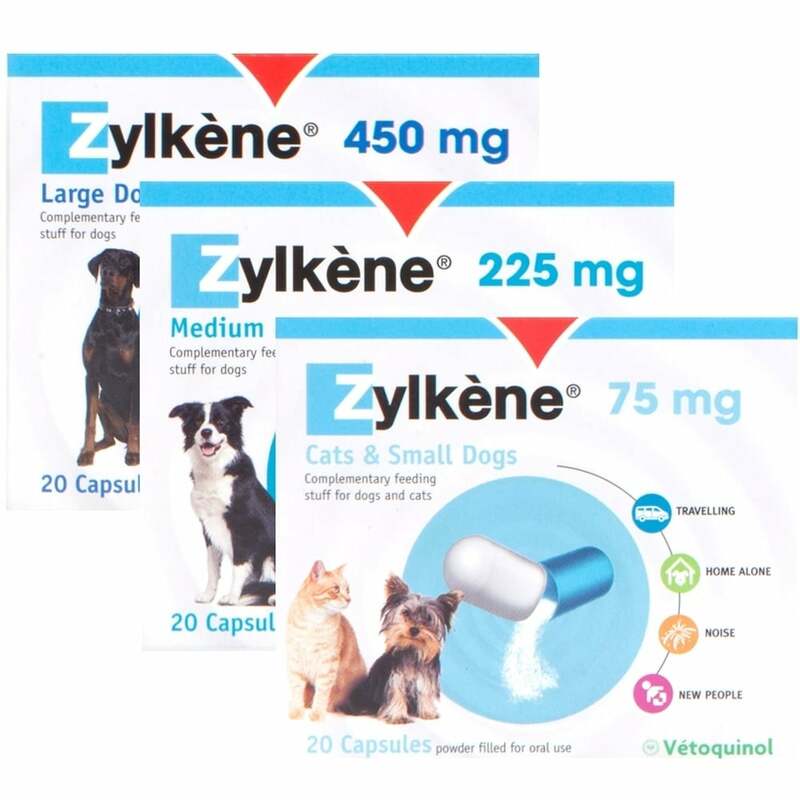 Discuss the use of Zylkene with your pet's veterinarian. 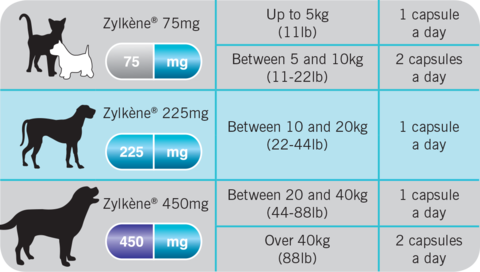 Together, you can decide if Zylkene would benefit your pet. It can be used for a number of things, long term or short term, such as travel, moving, adoption, grooming, meeting new people, loud noises, etc. All of the products listed above are safe, effective products. All pets are different, and have different needs. The best way to decide which product would work best for your pet is by discussing with your veterinarian. All of our doctors are happy to help. Stress and anxiety can weigh heavily on a household, and it's our goal to help you achieve a happy medium.